vignette design: If These Walls Could Talk! This bathroom used to belong to our daughter Ashley, who left home at 18 to go to college and never moved back. It has not been touched since. When she went away to college seven years ago, I just closed the door. Tomorrow, this bathroom will get a facelift, starting with these floors. This bathroom got a lot of wear and tear, and it shows. The previous owners also had daughters, hence the pink tile, circa 1993. I can't wait to tear out the floors and put down 12 inch black squares. On the diagonal. The tub surround will be replaced with...you guessed it! White subway tile. ...and the shower door will be removed in favor of an old fashioned shower curtain. I've already ordered this ticking stripe one from Pottery Barn. The thermofoil cabinet will come out too. It still has some of Ashley's makeup in the drawers. The counter with painted wood edge and surface mount sink. Out of here! The walls will be clad in white tongue and groove paneling. Which will cover up the bad sheetrock job. This sink console from Pottery Barn. It comes with Carrara marble top and sinks. Done. When Ashley comes home for her wedding in December, she will be pleasantly surprised by the change. And, our house will love the new bathroom. It will definitely be an upgrade that will improve its value. Your plans sound wonderful and exciting! I just completed two bathroom remodels in the last two years so I know you are excited! Careful, she may want to move back!! I love reading about your home! Beautiful choices! May we see some more of your Windsor Ware!! Love that shower curtain. I must remember that for our Florida house bathroom. The new sink/cabinet unit is fabulous! Can't wait to see it finished. Unfortunately, as much as I loved this post!!! I am now crying! It sounds just like my daughter's bathroom!! and the door is still shut! I've been thinking lately that I need to get upstairs and re-do her bath as well as my oldest son's bathroom....he's now 27! Wow...talk about memory lane! I can't wait to see the finished product!! Thanks for sharing!!! Love your ideas and inspirations, such a fresh clean look! 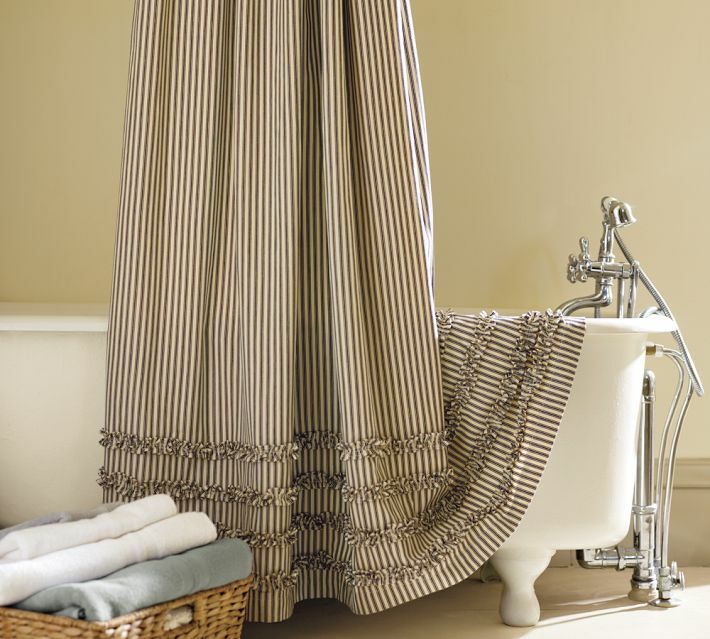 That ticking stripe with the crisp white and carerra will look amazing! Cannot wait to see it all unfold. Love the new plans! It's going to be so attractive! Congrats on the upcoming marriage of your daughter! Big moments! Two "new" bathrooms: can't wait to see them! Love the subway tile idea, of course. Hope you get these done in time.... and you will show us as it progresses,right??? All good choices, Delores. I cannot wait to see the final product. I love coming here to visit! I love your home and design sense and I absoultely love that you keep it real! Thanks for sharing, looking forward to all of the changes. It looks like it's going to be FAB. Can't wait to see the finished product. I also hope we'll get to see some of the fun surrounding Ashley's wedding. I'm sure you'll have lots of wonderful ideas for that as well. Thanks so much for sharing your home. It's going to look amazing. Love all of your choices!! Its going to be amazing. How exciting. It's going to be lovely. I do like that PB sink/counter. I can already envision how fabulous this is going to look! Can't wait for the reveal! Love your blog!! Cannot wait to see the final project. Sadly I have two bathrooms just like this one upstairs. One of my three daughters is still at home and will be for three more years. I am so torn between updating now or waiting. I cannot wait to see the PB console turns out.